Introducing the content creation method that built eight best-selling Kindle ebooks! Suddenly, my ebooks started selling… Instead of just sitting there collecting “digital dust” on Amazon! I'm literally handing over the EXACT METHOD I've used to publish my 8 best-selling ebooks on Kindle! 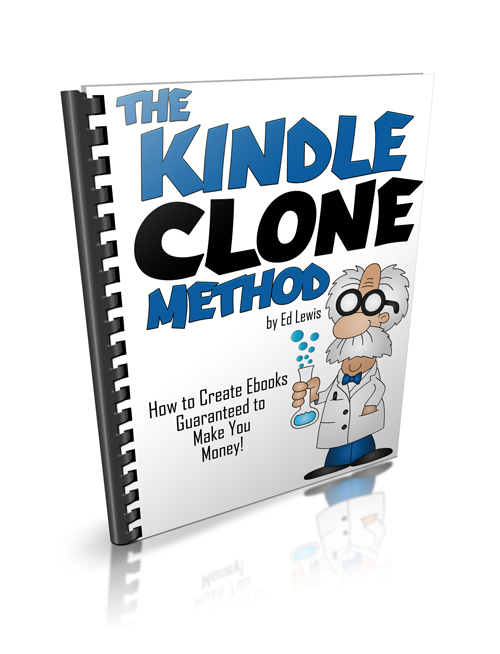 In the “Kindle Clone Method,” you will learn a proven method that will enable you to start creating ebooks that will outsell and outperform any of your competitor's books… Guaranteed! Never again will you need to create a Kindle ebook that nobody wants to buy. Why most Kindle authors do the exact OPPOSITE of what it takes to sell hundreds of copies of an ebook. Why competition is actually a GOOD thing. The TRUTH about original products. Why most new, original, or “revolutionary” products (like ebooks) fail miserably and leave the writer flat broke. Niches that make your competition IRRELEVANT. Amazon’s sales rank can't be trusted! Where to find the ebooks that are REALLY selling by the truckload. How to track exactly how many times an ebook sells (even if it is not your book). Page 10 reveals the secret. A simple technique for uncovering better and more in-depth research. These “crystal balls” reveal the exact information readers want to buy. The magic can be found on page 12. Seven questions tell you how to beat best-selling books: Spot their weaknesses, fill the gaps they leave, and take almost all their buyers and royalties! Turn complaints, rants, even vile, nasty comments into cold hard cash! How “role playing” can help you make better products! Page 14 demonstrates how you can put this idea into action. When less is more. Why making an ebook more simple could skyrocket sales through the roof! See page 15 right now. Devilish pricing trick used by best-selling fiction and non-fiction authors turns one sale into five, increases profits by at least 50%, and gets readers hooked on your content. Why the idea behind your book — the angle or “spin” you put on it — can be more important than the content inside it! How to write titles that showcase your “big idea” — You can write titles like “The Four Hour Workweek” and “The Millionaire Fastlane.” The tips for creating an outstanding book title start on page 19. How to use the “Zeignerik Effect” to anchor your title in the reader's mind. This is such a powerful writing tool that the reader won't be able to resist buying your book! Why readers DO judge a book by it's cover… and how to get a professional, polished cover without needing to hire a high-dollar, professional designer. Why conventional ecovers will KILL your sales and what to use instead. Page 24. FREE software creates professional covers for you… and it's not GIMP. See page 29. Having zero book reviews is like an empty parking lot… it's a BIG warning to potential customers. Four ways to get your book reviewed are on page 33. If you are at all concerned about whether we will be able to deliver on our promises or not, we do offer a 30-Day Money Back Guarantee on this offer. support ~at~ thephantomwriters.com to make your request. Please allow us up to 72-hours to process your refund request, as we do have lives off of the Internet too. Also be advised that if you file a dispute with PayPal concerning your purchase of our products, our money-back guarantee offer will become null-and-void, and we will fight all disputes and chargeback requests processed within PayPal, with the intent to win the dispute. If you are selling your books on Amazon Kindle for $2.99, you only need to sell five copies of your books to pay for this Kindle training guide. In other words, the money you spend today will be "money well spent," if you take action on what you are going to learn today. P.S. If for any reason you decide that you would like a refund on the product "Kindle Clone Method 2014", then drop us a quick note at our SUPPORT EMAIL address at: support ~at~ thephantomwriters.com. Copyright © 2014 Professional Book Marketing.com . All Rights Reserved.